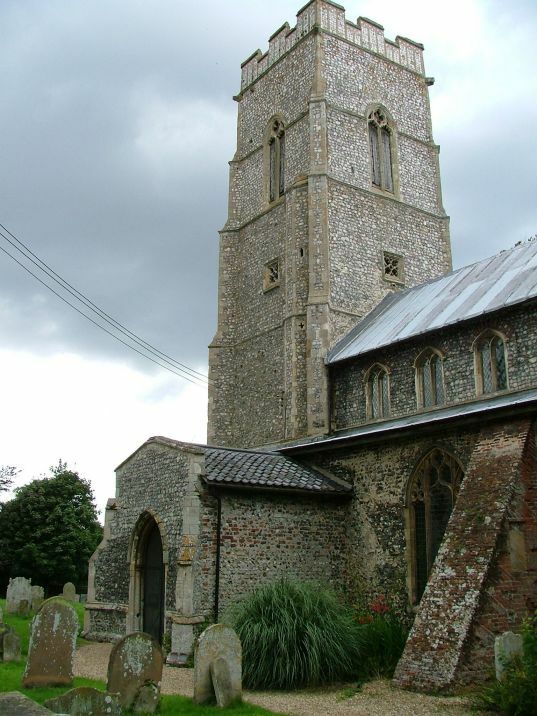 Banningham is a pleasant village just to the north of Aylsham. 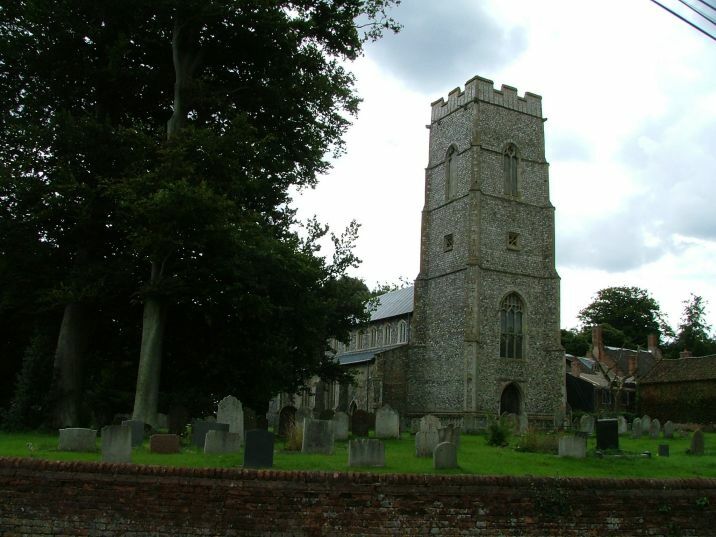 There is a village green with chestnut trees, this big church, and a decent pub opposite. I also liked the way that the houses around the green were just ordinary people's houses, not massive halls; this is a village of Norfolk people. 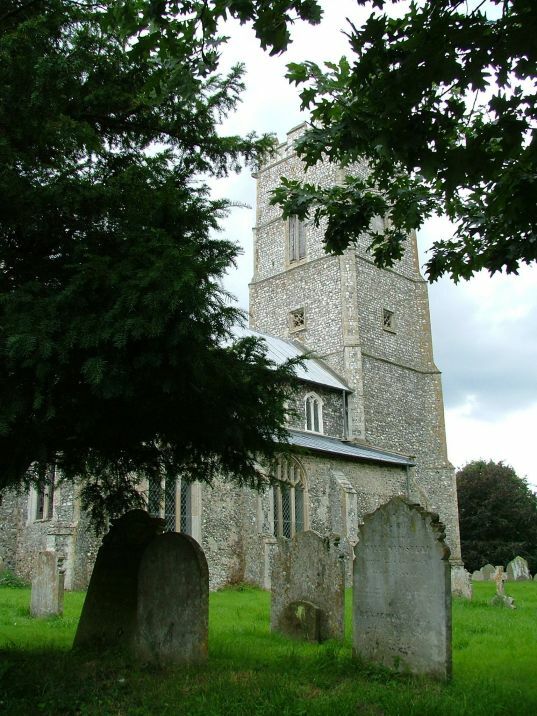 St Botolph, as I say, is big; the 15th century tower appears even more so, because it has a large number of short stages, making it seem as if it might be telescopic. 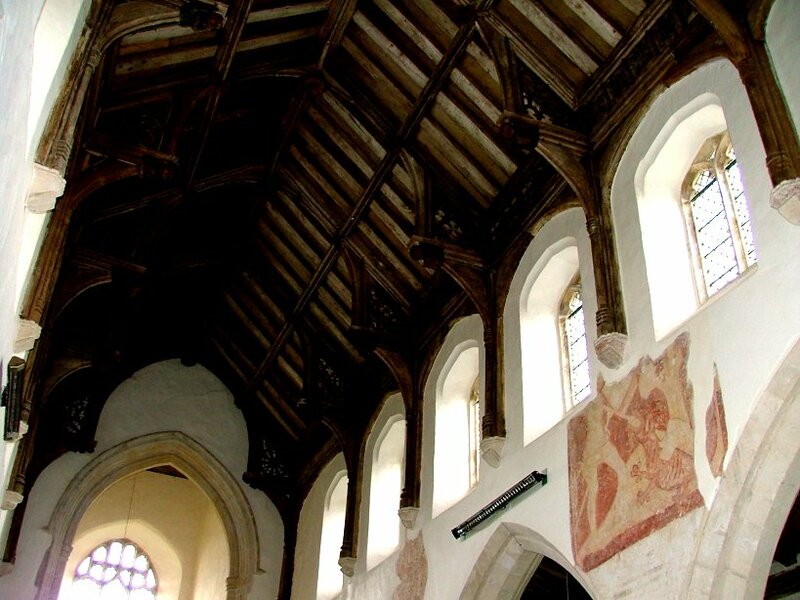 There are aisles, and a clerestory; a typical late medieval East Anglian rebuilding. You walk around to the south side, and the entrance for visitors is through the priest door in the chancel. his gives you a slightly skewed first sight of the inside, looking west into the high, open nave with its excellent 15th century roof. 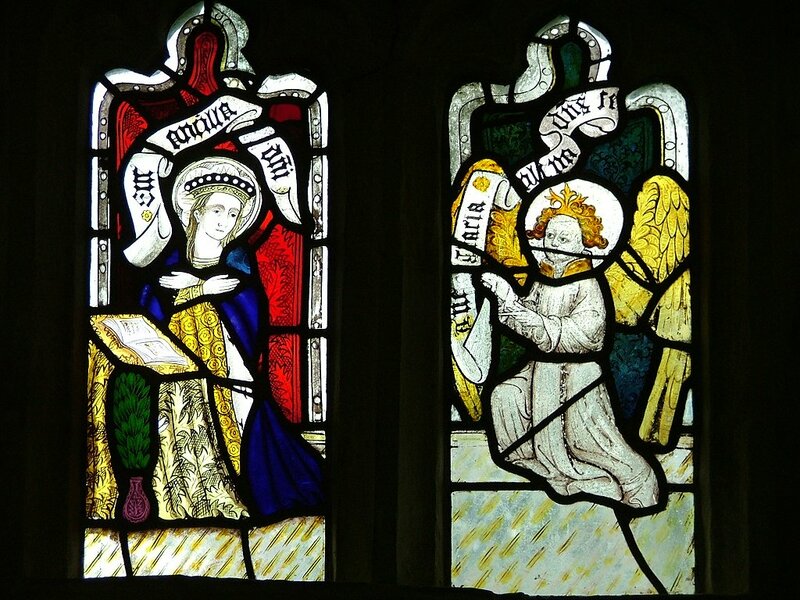 There are fine details, like an angel in a boat and another swinging a censer. 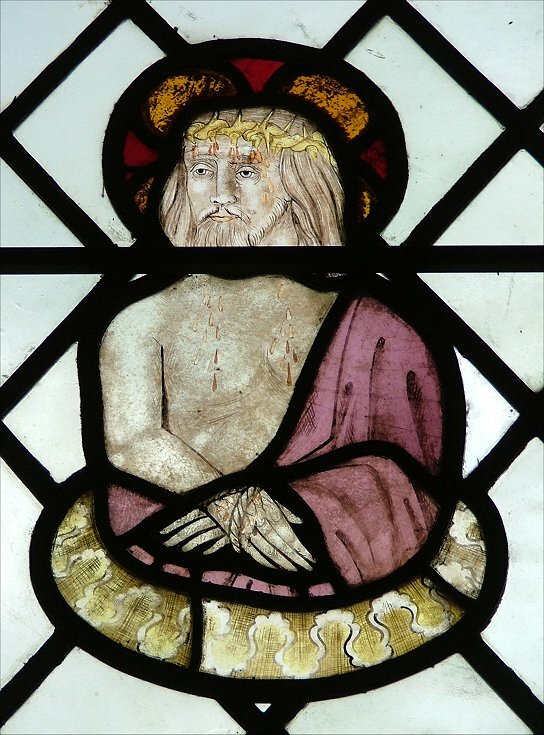 Looking around, there are more medieval survivals - glass, wall paintings and so on. 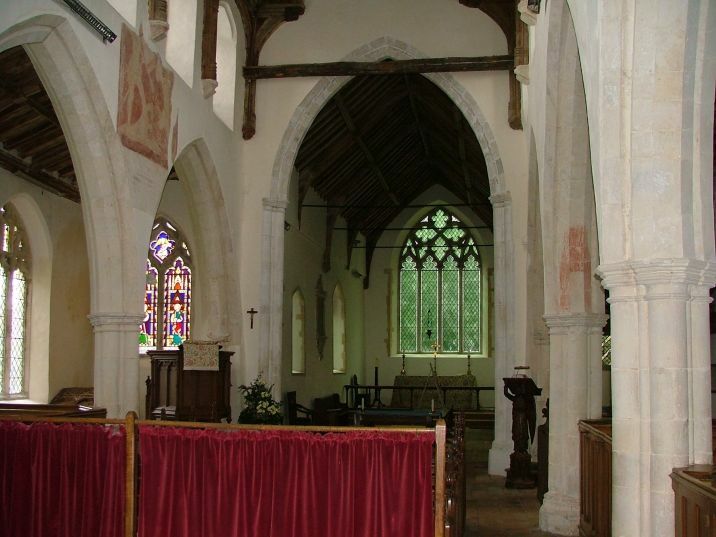 In some churches, such treasures would cause a sense of awe; but I think that St Botolph has been through some fairly major 20th century restorations, and the way the nave seating is clustered in the centre means that the church today rather turns its back on these things of the past. 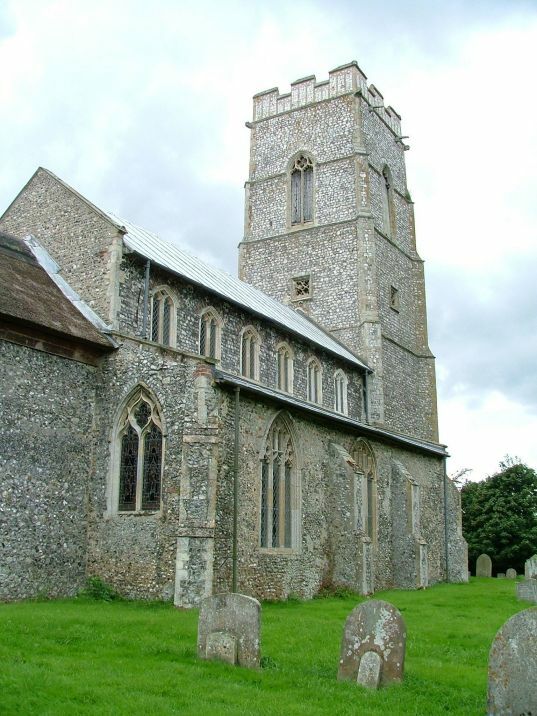 This is not meant as a criticism; this is an open, welcoming church, with much of interest - but there is a lack of atmosphere, and it is hard to imagine the building itself as the act of worship intended when it was built. 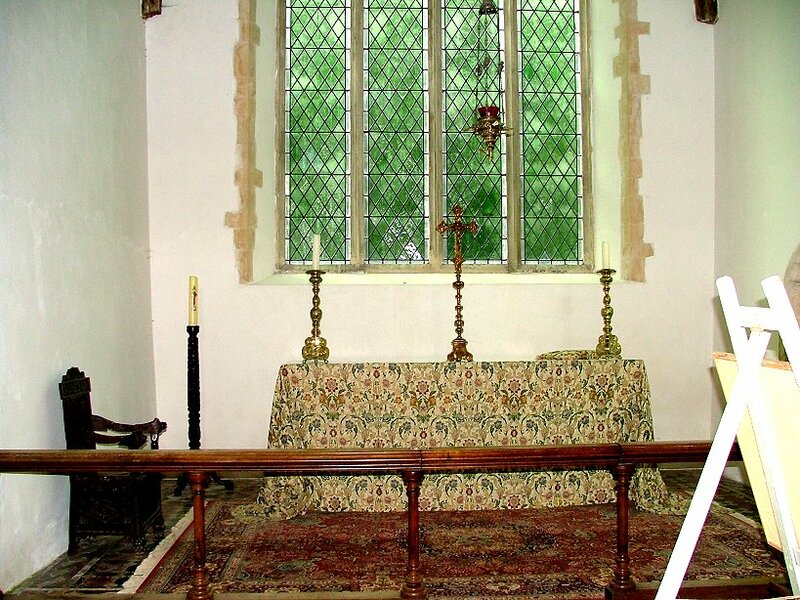 However, as Simon Jenkins reminds us, all churches are folk museums of the best kind. 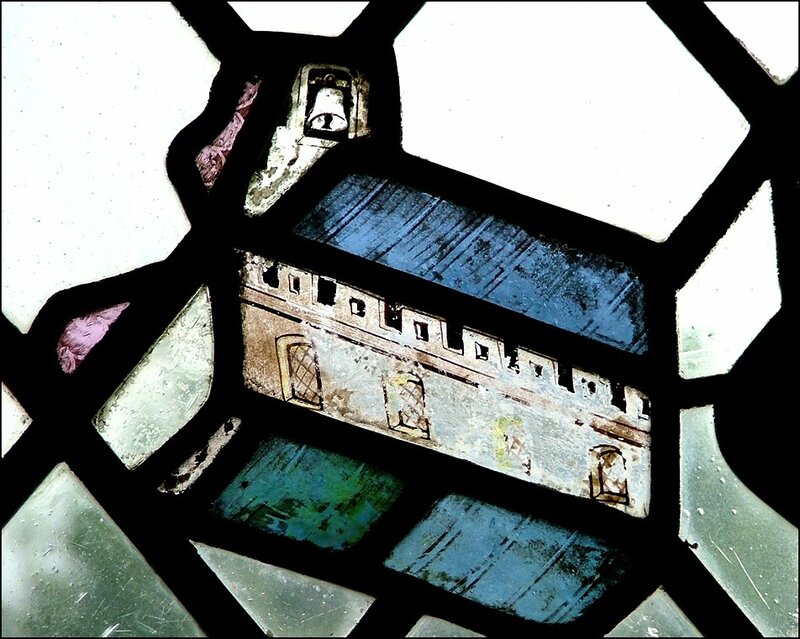 Perhaps the best survivals here after the roof are the reset fragments and figures in stained glass. 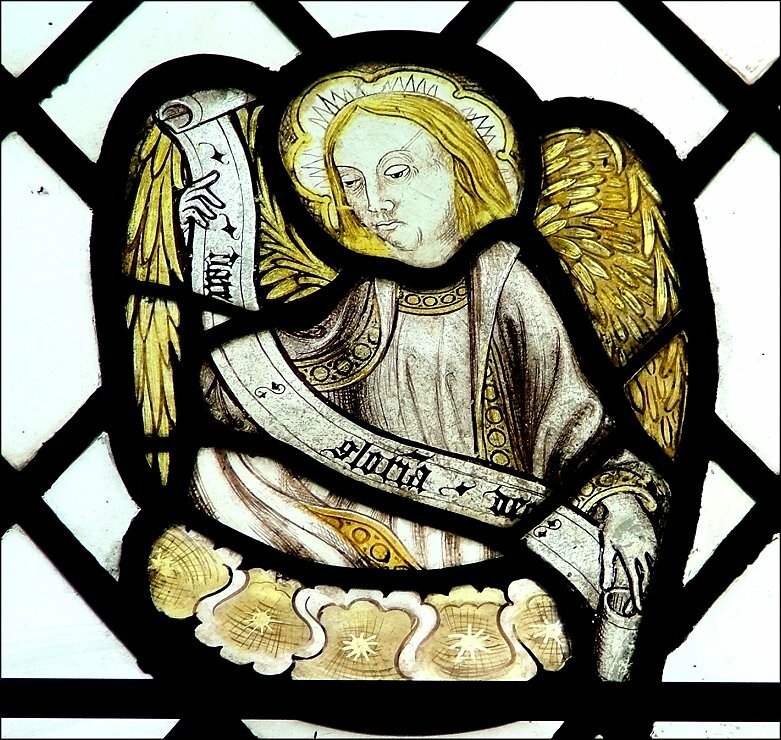 They date from the 14th and 15th centuries, and include several figures from a set of the Orders of Angels, as at Salle. 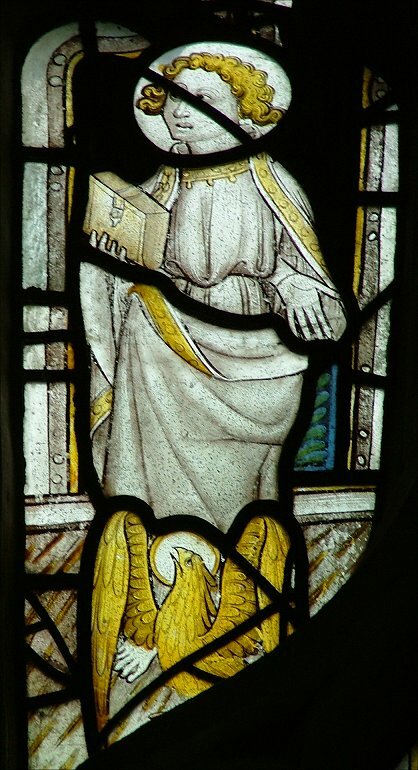 There is a large figure of Christ as the man of sorrows, St John the Evangelist with his eagle, another Saint with a book who has lost his symbol (but may be another St John), an Anunciation scene with Mary richly attired, and, perhaps most interesting, a tiny image of a church with a bell in a bellcote. 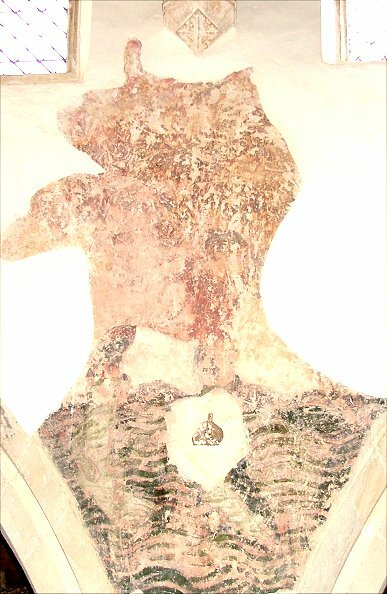 There are several wall paintings. 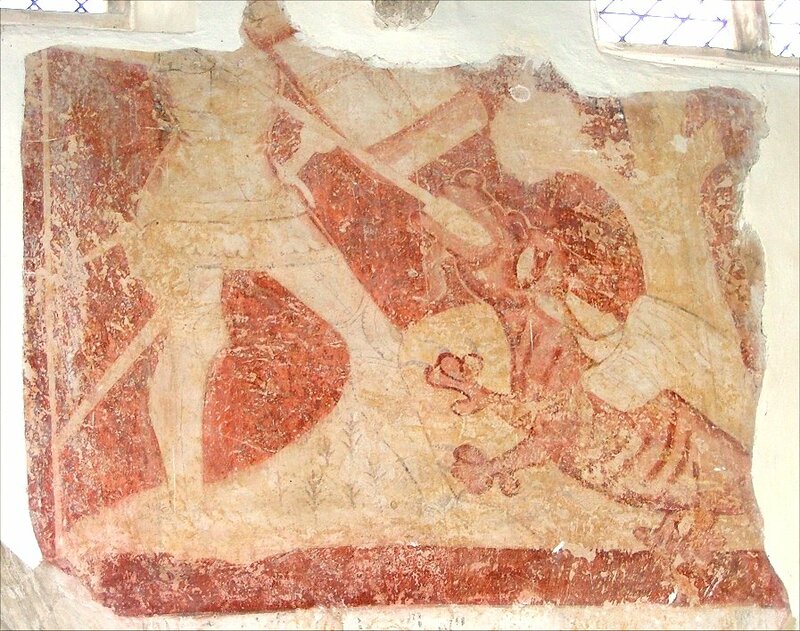 The best is of St George dispatching a dragon. Another shows the feet of St Christopher. 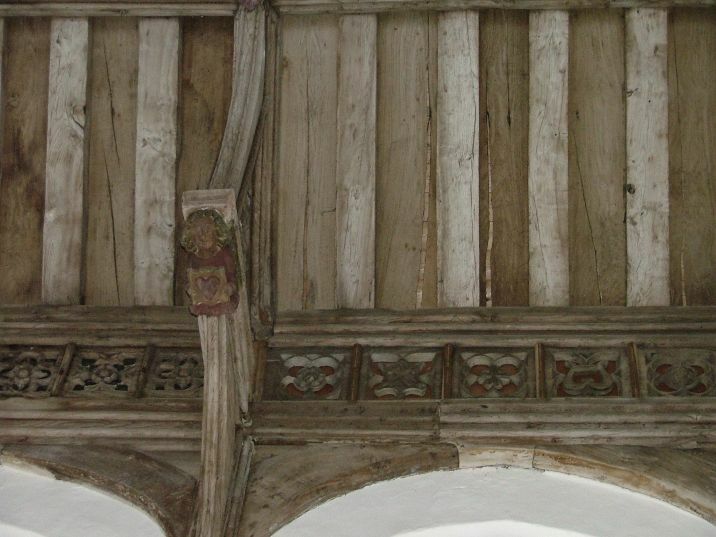 What is most interesting about them is that the 15th century clerestory has been punched through them. 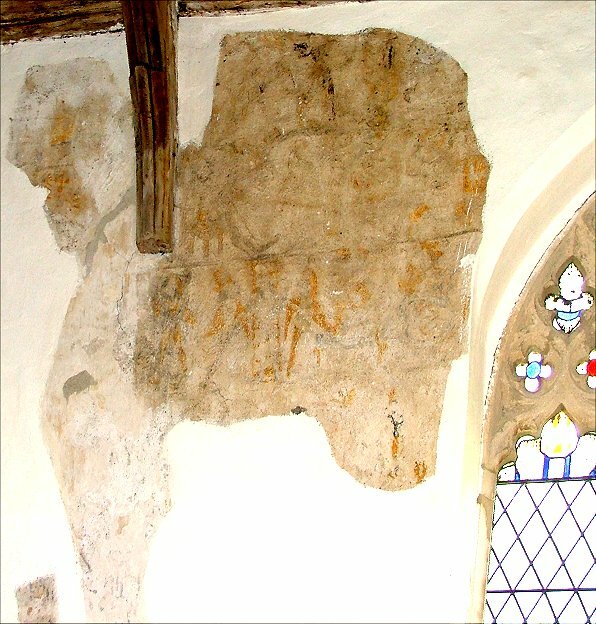 This is a reminder to us that many wall paintings, especially if of non-biblical and non-doctrinal subjects, were destroyed fully a century before the Reformation, during the late medieval Church's attempt to impose Catholic orthodoxy on these remote rural parishes. 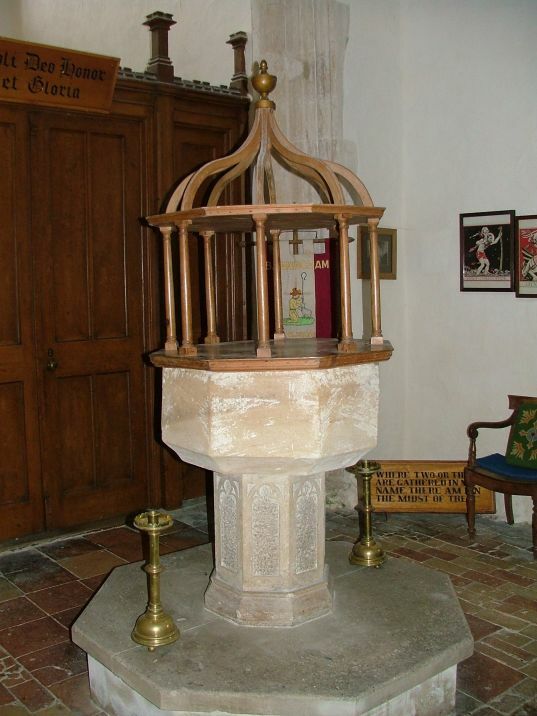 For enthusiasts of the 17th century there is an interesting font cover, and although the 19th century has left its usual array of furnishings and floorings, in all honesty the Victorianisation of St Botolph was not a bad one. 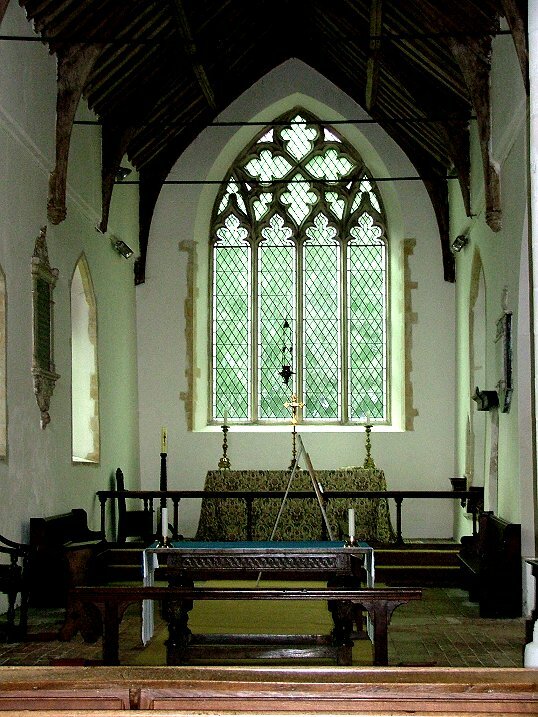 The chancel is seemly and full of light, though spoilt a little on a weekday by the noticeboards for visitors. 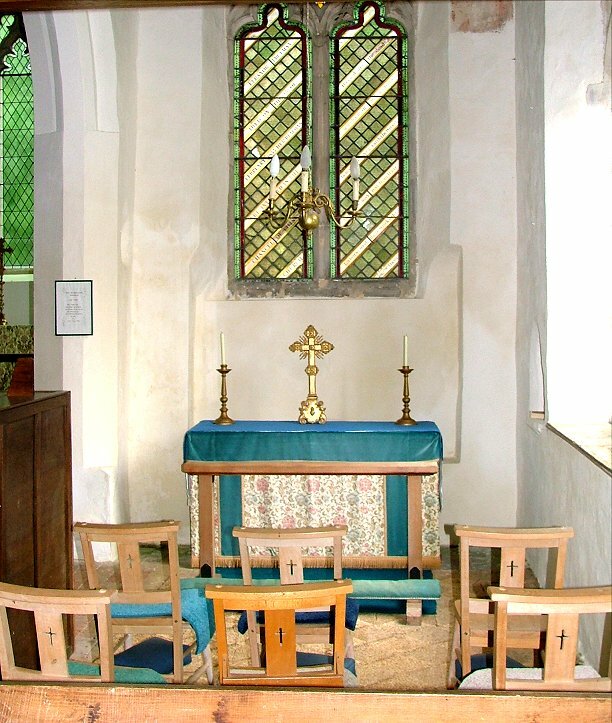 Best of all, I liked the south chancel chapel, screened by a little parclose and decked out in the manner of the late 19th century with turquoise dressings below a simple candelabrum and a two light east window with little quarries. A peaceful little place; although, as I say, not talking much to the medieval wonders around it.